Thanks alot for the link. May Sai Baba bring Muslims and Hindus together. 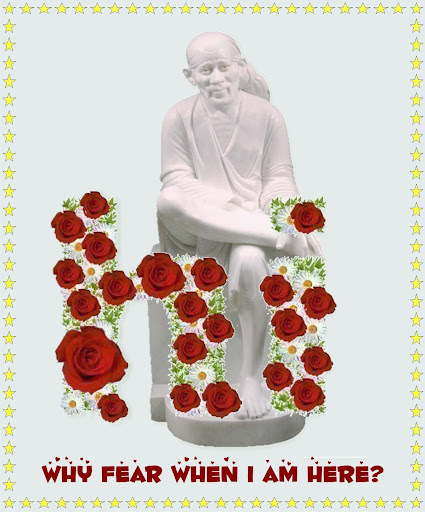 Sāī Bābā of Shirdi (d. 1918), also known as Shirdi Sai Baba, was an Indian guru, yogi and fakir who is regarded by his Hindu and Muslim followers as a saint. Some of his Hindu devotees believe that he was an incarnation of Shiva or Dattatreya, and he was regarded as a satguru and an incarnation of Kabir. The name 'Sai Baba' is a combination of Persian and Indian origin; Sāī (Sa'ih) is the Persian term for "holy one" or "saint", usually attributed to Islamic ascetics, whereas Bābā is a word meaning "father" used in Indian languages. The appellative thus refers to Sai Baba as being a "holy father" or "saintly father".His parentage, birth details, and life before the age of sixteen are obscure, which has led to a variety of speculations and theories attempting to explain the Baba's origins. In his life and teachings he tried to reconcile Hinduism and Islam: Sai Baba lived in a mosque, was buried in a Hindu temple, practised Hindu and Muslim rituals, and taught using words and figures that drew from both traditions. One of his well known epigrams says of God: "Allah Malik" ("God is Master"). Sai Baba taught a moral code of love, forgiveness, helping others, charity, contentment, inner peace, devotion to God and guru. His philosophy was Advaita Vedanta and his teachings consisted of elements both of this school as well as of bhakti and Islam. Sai Baba remains a popular saint and is worshipped mainly in Maharashtra, southern Gujarat, Andhra Pradesh and Karnataka). Debate on his Hindu or Muslim origins continue to take place. He is also revered by several notable Hindu, Sufi and Zoroastrian religious leaders. Some of his disciples received fame as spiritual figures and saints. Do u have audio of Mahamantra "Om Sai Shri Sai Jai Jai Sai".I want fast one and not slow one in Mahendra Kapoor voice. I currently do not have "Om Sai Shri Sai Jai Jai Sai" mantra audio. but i will try and find and if i get it by Sai baba's grace, i will surely post it here. Thanks a lot. This is my fav mantra. Few days back i lost my CD and today u gave me back. I need some bhajans of SAI BABA.. Audio songs which can be downloaded in my mobile phone.. I have 1 GB Memory card..
Can you send me some good bhajans.. like.. satguru mein teri patang hawa which udardhi jawangi.. i need baba bhajans..
Could you please post the lyrics for Om sai namoh namah? Page created in 1.013 seconds with 64 queries.